100 yuan is a series of commemorative and investment coins of China. Officially, they began to be released in 1979. 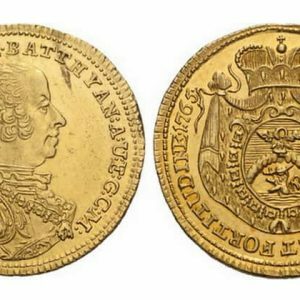 Nowadays, the collection is quite popular among coin collectors and investors, as it is characterized by excellent artistic appeal and minted from precious metals of the highest standard (999%). It includes the familiar to many Chinese coins of the Panda series and others modern Chinese coins of gold and silver. The first Chinese investment and commemorative coins, including 100 yuan, were issued by the People’s Bank of the country in 1979. Before starting production, there was a competition for the best design between different Mints. According to the established parameters, the image was required to reflect the culture and history of the country, as well as conform to certain technical standards. Notable that in China from 1948 to 1978 the gold coins was not minted. Did you know? The Panda investment coins of 100 yuan are issued under the control of the CGCI or China Gold Coin Incorporation. This company was established in 1987. Now it is controlled by the People’s Bank of China. The CGCI is responsible for the release of Chinese bullion and commemorative coins, and also gives an estimate of the national reserves of precious metals. 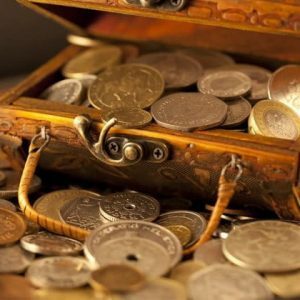 A part of the offices are responsible for the development of coins, design, coinage and distribution. 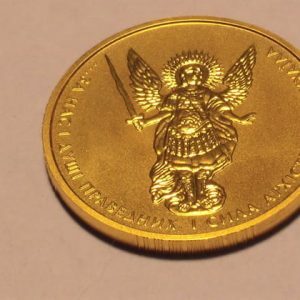 As the first investment coin in China worth 100 yuan, the gold “Panda” was chosen. The release was minted in 1982 in four sizes, but without indicating dignity. This series has become so popular among collectors and investors that every year they issued a unique print run with a design unlike the previous ones (it was repeated only in 2001 and 2002). 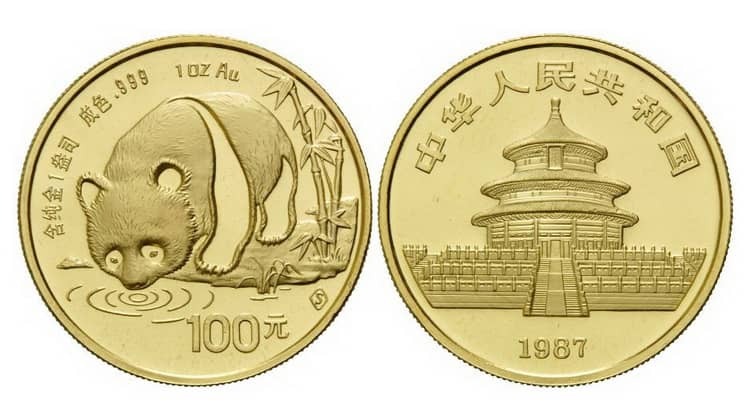 In 1983, coins were issued with the image of a traditional Chinese animal, but with an indication of denomination. In total, several denominations of “Pandas” were minted from gold: 20, 50, 100, 200, 500 yuan. The weight of each coin was calculated in troy ounces and corresponded to 1/20, 1/10, 1/4, ½ and 1 ounces. After 2016, when in China the mass of the system of troy ounces of gold products was converted to the metric system of grams, the value of 100 yuan changed from 1/4 ounce to 8 grams. The diameter of the coin was 21.95 mm, and width − 1.53 mm. Did you know? Unlike investment and commemorative coins Australia, USA or South Africa, Chinese 100 yuan does not have a mark about the place of production. In some cases, a slight difference in the size of the year of issue or the style of the temple shows where this coin was produced. In total, China has four Mint yards where precious metal samples are produced. No less interesting are 100 yuan of the Chinese Lunar Calendar series for those who invest in coins that depict mythological animals in chronological order. The first edition was released in 1981 (the year of the Rooster), and copies of 100 yuan supplemented the collection in 1988 (the year of the Dragon). In 1988-1989 3,000 pieces were minted, in 1990 – 6,000 pieces, in 1991-1992 – 1 900 pieces. Further release ranged from 6,000 pieces. The series became so popular that it was also duplicated from silver. Did you know? The release is still in strict order. Despite the fact that Lunar is minted in other countries, it is the Chinese version that is most popular among investors and collectors. Designers have developed original themes and compositions with images of all the animals of the eastern horoscope. The images are placed on the reverse of the coins, and around are inscriptions in the form of Chinese characters. The quality of the commemorative coins of 100 yuan with celebrities was so high that the portraits of great people on the surface differed slightly from the photos and historical images. 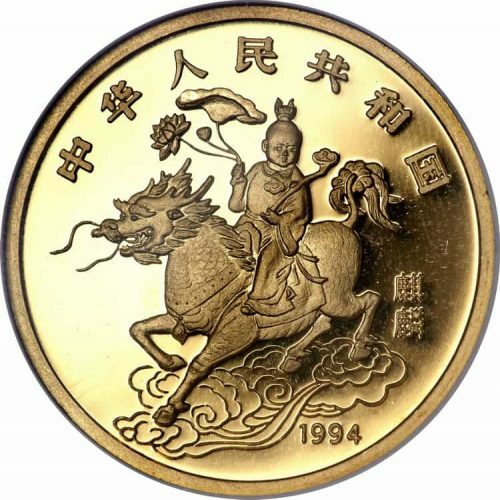 From 1994 to 1997, China issued a unique circulation of coins with a face value of 100 yuan with a price slightly higher than other investment specimens. On the surface there is a unicorn – a Chinese symbol, which is one of the four most noble animals. Unicorn is revered on the same level as the dragon. According to legend, he guards people on earth and symbolizes life expectancy, happiness and positive energy. This series refers to rare gold and silver Chinese coins. More modern series are produced from both gold and silver. The most popular samples are minted in honor of the landmark events in the life of the country. These include 100 yuan of China, confined to the 2018 FIFA World Cup and commemorative coins in memory of Marco Polo, a traveler who studied China and wrote a book about this country. Chinese coins of 100 yuan of the Panda series are preferred not only by investors in precious metals, but also by collectors. They attract by the unusual design and rich variety of images. The surface depicts a traditional animal in its natural habitat. The first series of coins is significantly different from modern specimens. The drawing of the panda was not so clearly and minted in detail, and the surface was not a mirror like on the samples as a Proof. 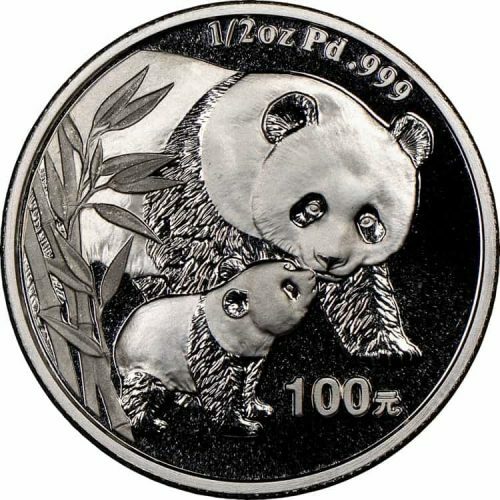 On the silver “Pandas” engravers managed to achieve almost impossible. With the help of metal, they were able to convey the light and black patches of the wool of a traditional animal. 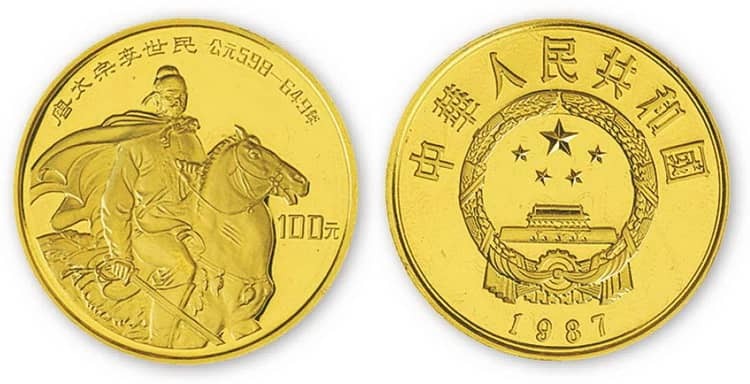 Chen Jian, the master of the Shanghai Mint, was the author of the 1982 coin design and modern designs. He ensured that on the surface the black color of the eyes, ears and paws, as well as the villi of the fur, was transmitted. The reverse side of the coin 100 yuan looks the same as in the first samples. Unchanged remains the image of Chinese landmarks – the Temple of Heaven. Above the semicircle is an inscription made in Chinese characters in the translation “Zhonghua Renmin Gongheguo” (People’s Republic of China), and the year of issue is minted under the image. The parameters of all coins of China in denominations of 100 yuan (weight, diameter, test) look like the parameters of the “Panda”. Did you know? The Chinese Series “Unicorn” was a short-term release. Limited edition kits released by the Chinese Mint of 1,000 each. On the surface of 100 yuan, one can see both the eastern (Qilin) and the western incarnation (Unicorn) of this mythical animal. In traditional Chinese culture, Qilin is a magical creature with a foreshadowing of prosperity. He has a dragon head with reindeer horns, fish scales, bull’s hooves and a lion’s tail. Originally, during the Ming Dynasty (1368-1644), Jilin was associated with a giraffe. During this period, the famous Admiral Zheng He (1371-1433) brought the giraffes for the first time from Africa. 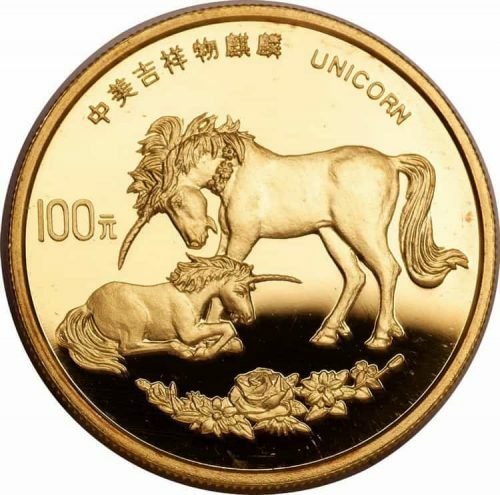 On the obverse of 100 yuan “Unicorn” there is the respected animal, decorated with a wreath on its neck. On its background and under the feet are flowers. The Chinese inscription and the word “unicorn” are engraved just above the mythical creature. The par value is entered in the left margin. The reverse depicts a Chinese sage holding flowers in his hands and riding Tsilin (a creature with a horse’s body and a dragon’s head). The legend runs along the top edge of the coin and consists of a simplified Chinese font, which is translated as “People’s Republic of China”. The popularity of “Panda” has led to the fact that the production of China has significantly increased the circulation of coins. If in the first years of production ranged from 10,000 to 20,000 units, nowadays this figure has increased to 70,000. In 1984, the circulation of “Unicorn” amounted to 50,000 pieces as Brilliant Uncirculated and 4,000 as Proof. In subsequent years, the circulation has not changed. 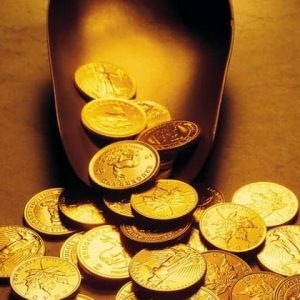 Despite the fact that the value of investment coins is determined by the current price of gold on the exchange, Chinese coins of 100 yuan are worth much more. This is due to the increased interest in the series “Panda” and “Unicorn” from coin collectors and impeccable quality of performance. For coins of 1982 issue, the price reaches 3,500 $ USD despite the fact that their market value is about 1,500 $ USD.